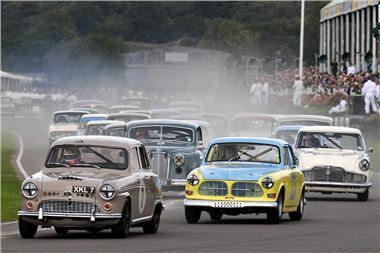 1 x 30 mins race TOURING GREATS pre-'60 touring cars (incll 'XKteers') (Grid now full + reserves). 1 x 30-mins race GRAND TOURING GREATS featuring the 'A-Series Challenge'. 1 x 45-mins Amalgamated race for both Series: (54 Starters). TOURING GREATS pre-'60 touring cars (incl 'XKteers'). GRAND TOURING GREATS featuring the 'A-Series Challenge'. 1 x 45 mins race TOURING GREATS pre-'60 touring cars (incl 'XKteers'). 1 x 45-mins race GRAND TOURING GREATS featuring the 'A-Series Challenge'.